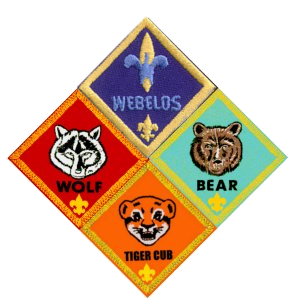 Pack Meetings (when all of our scouts, 1st-5th grade, get together in the same place - with the Cubmaster) are normally held on the last Friday of the month at the Community Center in Sewell. See our Calendar for our next Pack Meeting. Den Meetings (when just one age group meets - with the Den Leader) are usually held twice a month and when there are specific outings. As a pack we strive to keep scouting affordable for everyone. There is a registration fee set by the Pack Committee due at the beginning of each year. That has been $75 for the past 3 years, and covers all uniform patches, scout handbook, neckerchief and slide, most program and event costs, and all awards earned during the year. Scouts who participate in our popcorn fundraiser each fall, receive a registration fee refund of 10% of their total sales, which enables scouts to participate for little to no cost. Donated uniforms are also available from the pack or scouts would need to purchase a uniform. The uniform for 1st - 3rd grade is a blue Cub Scout shirt, rank specific hat, and any blue pants, but no jeans. During Webelos (4th and 5th grade) scouts usually transition to the beige Boy Scout uniform.